6pm (note the early start) for a tour of the Studios. Holborn Studios, the film and photography studios housed in a historic industrial building by the Regent's Canal, have been providing outstanding service, in an atmospheric venue, for over 30 years. A customer comment from their website - "More than any other London studio, Holborn has got History. From the multitude of iconic shoots over the last three decades to the classic images that adorn the walls. But it's more than just that, when you photograph there you can feel it too. There are many popular shooting spaces in this town but Holborn is more than just "pop," it has soul too." 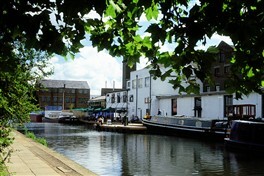 The Studios have faced a series of threats to their continued existence on the Regent's Canal. Having seen off a previous proposal that removed the studios from the site, Holborn Studios are currently challenging the granting of a planning permission for comprehensive demolition and redevelopment which would drastically reduce the size of the studios making them unsuitable for a whole range of activities currently undertaken at the site. The tour will be followed by the formal Annual General Meeting, at 7:30pm. Please confirm your attendance by Tuesday 7th November 2017 by registering below. This event is free to all but booking is strongly recommended. Members and non-members are welcome, but only paid-up members may vote on matters at the AGM. 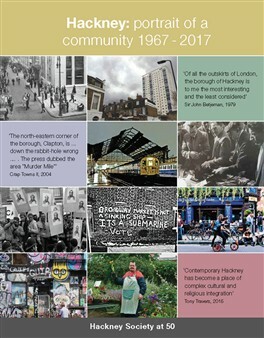 Copies of our new book, Hackney: portrait of a community 1967 - 2017, hot off the press, will be available to purchase at £18 (£16 for members) on the night. NB Any member wishing to stand as a Trustee should request a nomination form by email from info@hackneysociety.org. Closing date for returned nomination forms in Tuesday 7th November 2017. Buses: 4, 19, 21, 38, 56, 76, 141, and 271 stops at Eagle Wharf Road, by Shoreditch Park. 394 stops at Murray Grove. Both stops are a 5 minute walk away.